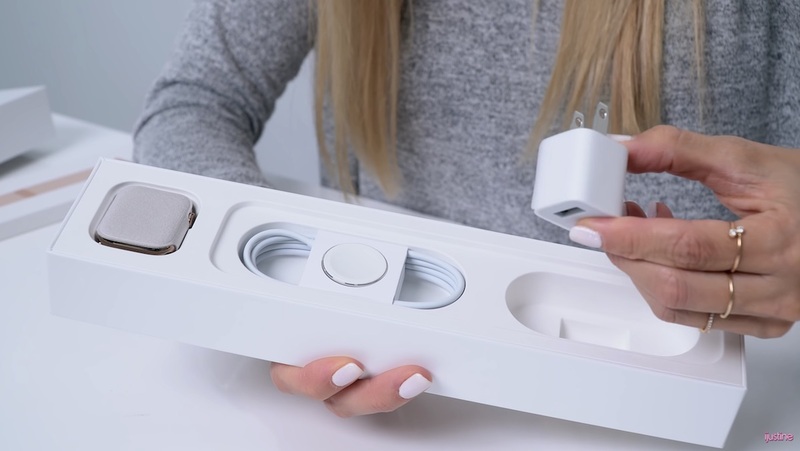 A few days after unboxing videos for the iPhone XS and iPhone XS Max were shared online, some of the same YouTubers have now provided a glimpse into the unboxing experience of the Apple Watch Series 4. Unlike this year's new iPhones, the Apple Watch Series 4's packaging is noticeably different from previous generations. To start off, iJustine unboxed the Apple Watch Series 4 40mm Gold Stainless Steel Case with a Milanese Loop, as well as the Hibiscus Sport Loop and Lavender Sport Band. Apple changed up the packaging for the Series 4, and instead of a square box for stainless steel cases, this year the higher-end Apple Watch models also come in a rectangular box. The outer packaging opens up to reveal Apple Watch artwork, and inside there are two separate boxes: one holding the Apple Watch, charging cord, power brick, and paperwork, and the second holding the Apple Watch band. The Apple Watch case itself is also protected by a small fabric sleeve. Previous stainless steel Apple Watches were protected in a large, square plastic case that also held the Apple Watch band. 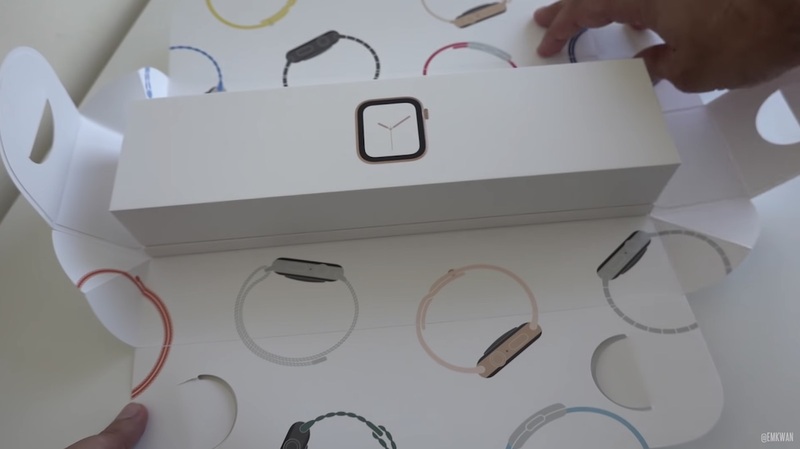 YouTuber Emkwan Reviews unboxed the same Apple Watch as iJustine, but in 44mm instead of 40mm. Spanish YouTuber Victor Abarca unboxed the Apple Watch Series 4 with the 40mm Space Gray Aluminum Case, showing off packaging that mimics the stainless steel Series 4's packaging. Aluminum owners will see the same pull tabs on the back of the packaging that opens up to two separate boxes inside, one holding the Apple Watch and another holding their band of choice. Additionally, it appears that if you get the Space Gray Apple Watch, the small fabric sleeve protecting the case will also be Space Gray. Apple's decision to package each version of the Apple Watch the same in 2018 is a big difference from previous Apple Watch generations. For the Apple Watch Series 3 and prior versions, the aluminum Apple Watch models came in slimmer, rectangular boxes, while the premium stainless steel models were encased in larger, square boxes that included the plastic case. The Apple Watch Series 4 will launch tomorrow, September 21, so the first pre-order customers can expect to receive their Series 4 devices throughout the day on Friday. After reviews for the Apple Watch Series 4 praised the smartwatch's display and health benefits, Apple highlighted some review snippets on its website. Off topic but not really... iJustine is so annoying. I was going to write the same! AHAHAHA Annoying AF! All these youtubers are annoying. I’m guessing they don’t buy these as they get them before launch. Get a job and earn your gadgets. Reviewing and commenting about tech literally is their job. I'm sure they earn everything they get... just like you do at your job. They just have different ancillary benefits (early access to tech) than you do with your gig. Wow, people opening boxes and looking inside. You have no obligation to listen to any youtuber you find annoying. Why the need to let everyone know? To find people to commiserate with. Sounds like jealousy. At least she can do Yoga and run a treadmill in a review unlile the snoozefest reviews. Apple Watches don’t tend to become classics you hand down in your family tho.